The geological formation presented below is perhaps not what you think it is. It's an outcome of slow erosion; it’s not some prehistoric asteroid impact. 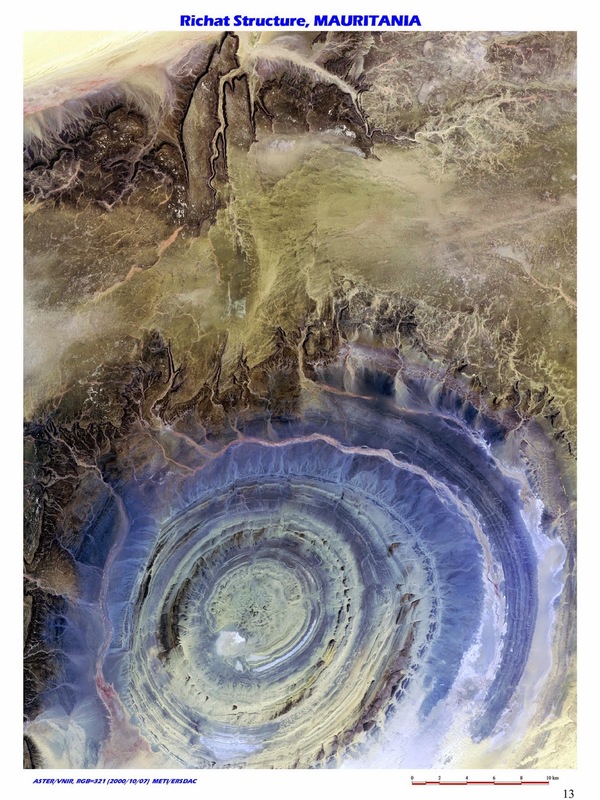 It is located in palce known as Mauritania and it’s a Richat Structure in Mauritania. This awesome structure is also known as the Eye of the Sahara and it is a landmark for astronauts. If you've been busy in performing experiments and haven't looked out the window for a sometime, it's difficult to know where you are, particularly if you're over a gigantic 3,600,000-square-mile desert. This bull's-eye orients astronauts, immediately. Strangely, it seems not to be the mark of a meteorite but an intensely eroded dome, with a rainbow-inspired colour order.